Let’s play a game with the TAG Heuer Monaco 24, as follows: Let’s say that you collect vintage Heuer chronographs, primarily the racing chronographs from the 1960s and 1970s (Autavia, Carrera, Monaco, Silverstone, Montreal, etc.). You are a committed collector, who enjoys the style and history of these watches, as well as the fact that they are reliable timepieces that you can wear on a daily basis. 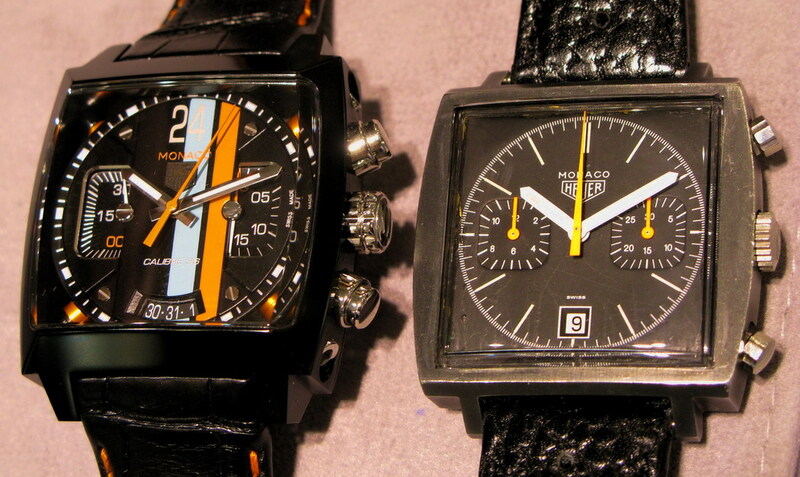 One of your favorite chronographs is the black PVD-coated Monaco (Reference 74033 N), as shown below right. You are wearing this old Monaco one day, when you walk into a local watch store, and see the new TAG Heuer Monaco 24, as shown below left. 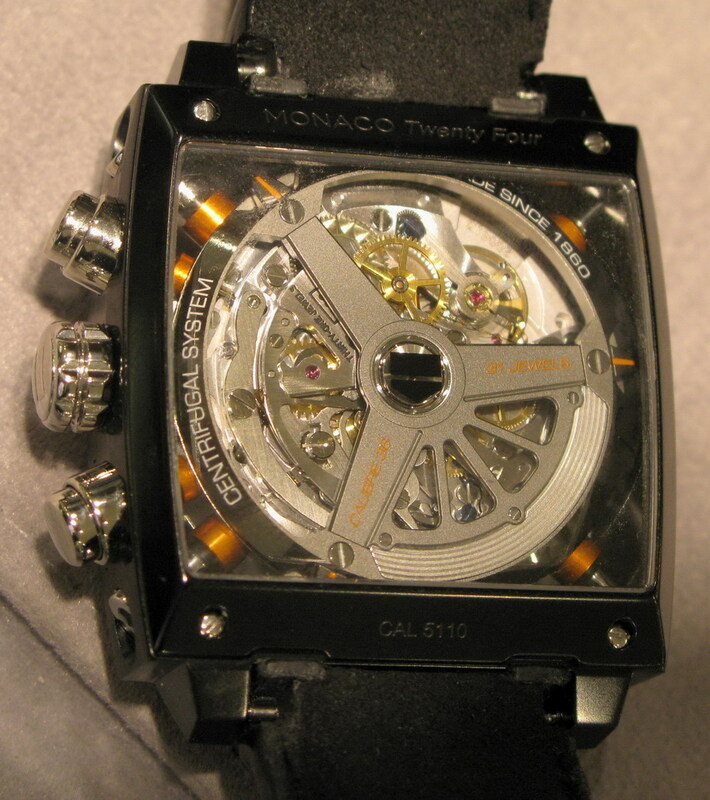 So here is our game, which we will call “Monaco 24, in the Land of Make Believe”: Please review the photographs of the Monaco 24 (which are of the watch that I actually saw, in the metal), as well as the specifications for the watch listed below. 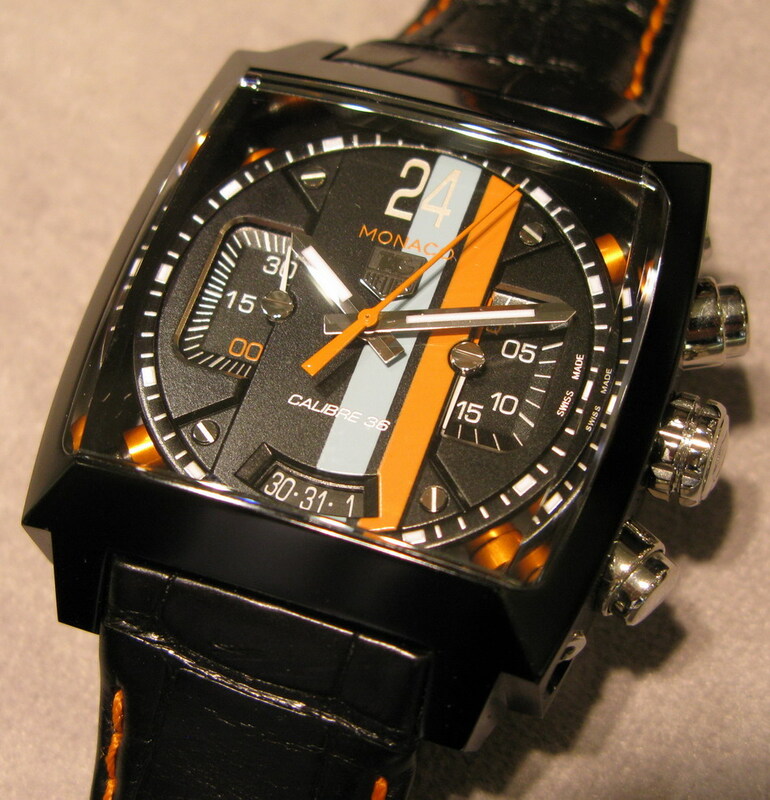 Then tell us exactly how you would like the Monaco 24 altered, so that you would actually buy the watch. Too big or too small? Would you prefer a different color scheme? You can be aggressive (for example adding a third register for the hours), but please try to be realistic (you can’t have it produced in rose gold, and lower the price to $1,995). We have had previous discussions on the question of whether the “vintage guys” will ever buy a modern, new watch. In The Land of Make Believe, with the ability to change the various elements of the watch, every vintage collector should be able to construct a Monaco 24 to his or her liking. I look forward to seeing some responses, then I will post my own list of “modifications”.